Lovely image of a family on the water, with their reflections visible in the ripples of the water. The July winner of our monthly schools photographic competition Water Works is 15-year-old Aaron Hawthorne from Motherwell. Describing his entry of a swan and cygnets on Lanark Loch, Aaron said: "A lot of us don't realise how important water is in the world today. It's not just a refreshing drink, or a cleaning material. For some animals, water is their home. 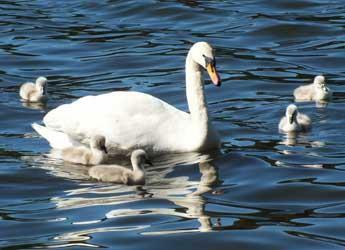 I'm sure everyone will agree that water certainly works for this swan and her cygnets." Judging his entry this month's winner the judges added: "Lovely image of a family on the water, with their reflections visible in the ripples of the water." The judges also highly commended entries from 16-year-old Andrew Crosbie of Bannerman High School, Glasgow and 15-yera-old Julian Scott, of Dundee. All the July entries can be seen on our Facebook gallery page. Full details of the competition and how to enter can be found here. A winner will be chosen each month as well as an overall winner for the year who will receive vouchers and a canvas print of their photograph. The Water Works competition is being run by CREW, the Centre of Expertise for Waters.